The NITESat mission team recently submitted its preliminary design to an independent review board for assessment. The review board examined the preliminary design to ensure that it meets the mission’s top-level requirements and is consistent with the mission goals and objectives. The team presented the mission concept of operations, the system architecture, and proposed technical implementations. The system architecture for the satellite is based on an ISIS 2U cubesat frame and incorporates a number of off-the-shelf components from GOMSpace to handle standard functions including solars arrays and electrical power system, communications, command and control, and attitude determination and control. 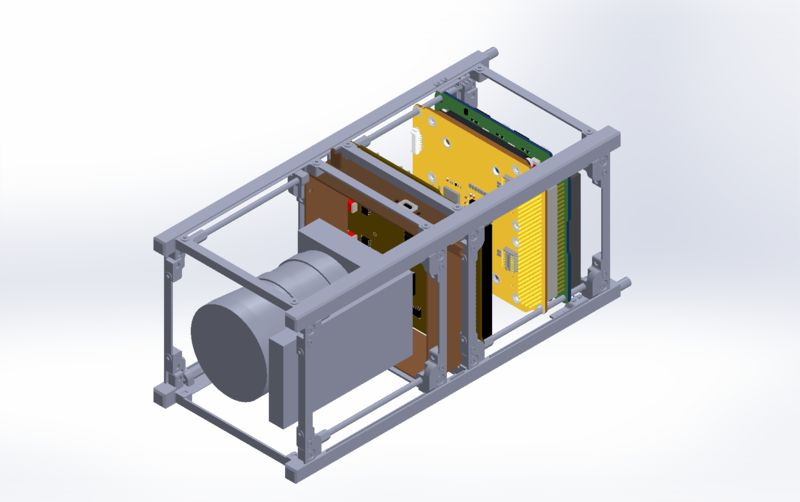 The imaging payload consists of separate lens, camera board, and imaging controller components that will be assembled by the NITESat team. The imager will use simple direct nadir imaging, so no targeting will be required. The field of view will be 30º, which provides for a 200km ground imaging swath at the expected orbital altitude of 450km. Target pixel resolution will be 200m on the ground. The ranging payload is a custom-designed repeater module and a modified GOMSpace antenna. It is a time-multiplexed repeater with a synchronization beacon and is fully independent from the satellite’s comm system. It operates in the upper-UHF band (e.g. 900 MHz) using direct-sequence spread spectrum modulation, allowing a smaller antenna, lower power, and inexpensive electronics. All three reviewers found the mission concept exciting. Their assessment of the preliminary design was very positive and provided useful feedback to the NITESat team. NITESat (Night Imaging & Tracking Experiment Satellite) is a nanosatellite mission to acquire high quality night imagery of Earth from orbit to measure the quantity and quality of light pollution across the United States from orbit. The mission offers an opportunity to make a marked increase in out understanding of the effects of light pollution on our environment and particularly the loss of the night sky. Previous attempts to characterize nighttime illumination have suffered from numerous limiting problems, making accurate measurements of light pollution difficult to acquire. NITESat plans to address some of these shortcomings with higher spatial resolution, synchronized ground callibration, collecting multispectral data to distinguish sources of illumination, and varied overpass times. The NITESat mission is sponsored, designed, and built by the Adler Planetarium’s Far Horizons program and its participants. Orbital Transports is providing the NITESat mission with space technology design and engineering, and project management services.